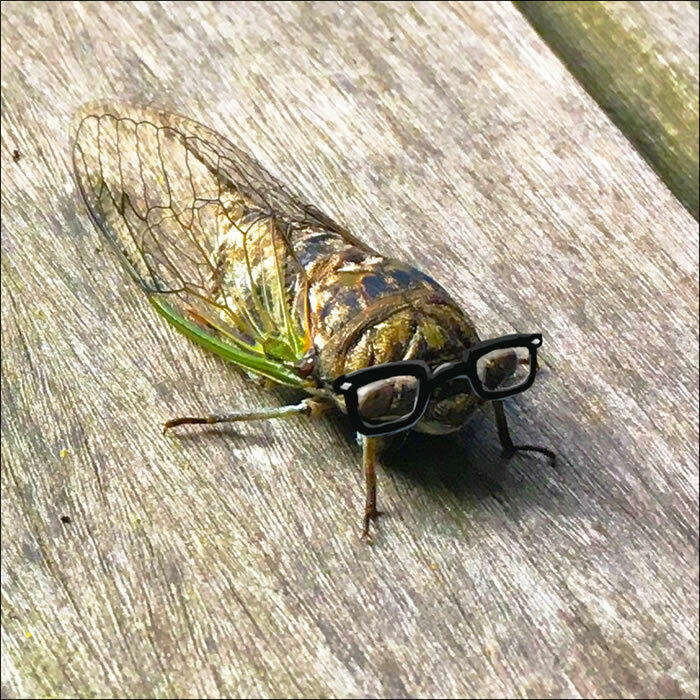 I love the sound of cicadas this time of year. That’s the real sound of summer! This big boy dropped by my deck the other evening. I couldn’t understand why he was looking at me so funny and then I realized we were wearing the same glasses! A very special package came the other day. It's exciting when the first copies of a new book are delivered and I can finally hold them in my hands! Books are hard to make. From that first burst of inspiration through all the twists and turns, misstarts, long hours and late nights, revisions, sketches, and paintings, it feels amazing when they're finally completed, printed and bound. They're real now. 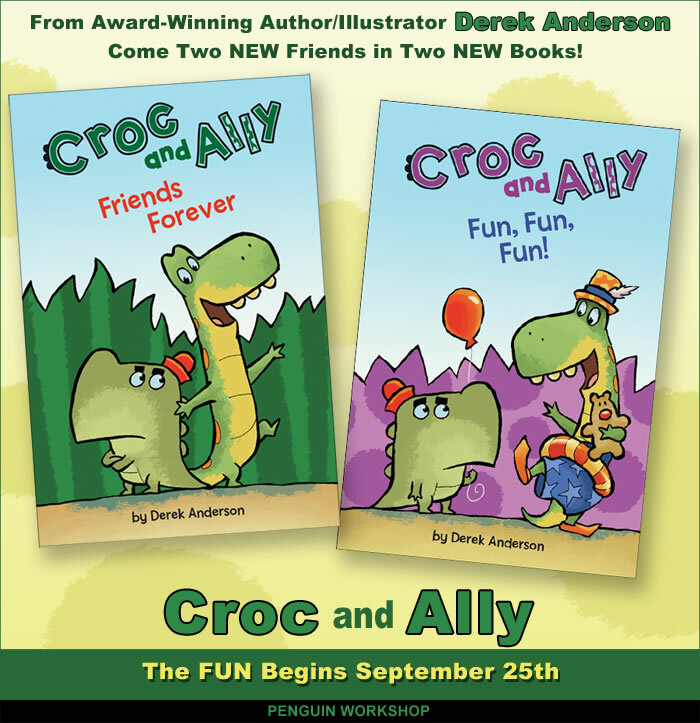 I can't wait for you to meet Croc and Ally on September 25th! Endless thanks to Sarah and Julia at Penguin Workshop for their patience, guidance and for venturing into this silly swamp with me! 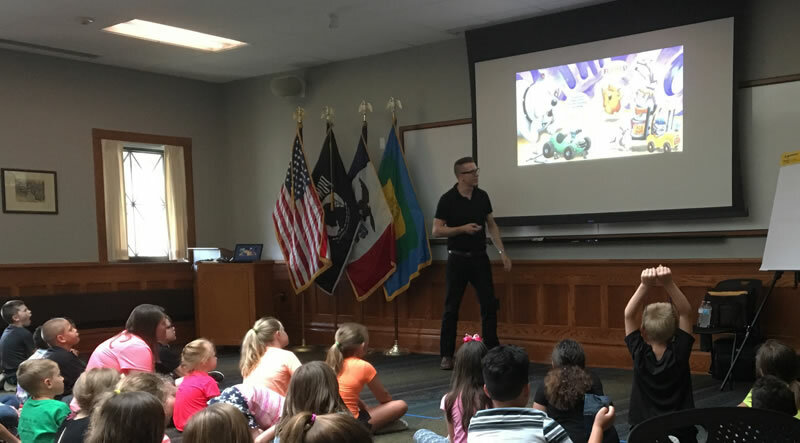 It was so much fun to be part of Carnegie-Stout Public Library 'Libraries Rock' Reading Program in Dubuque, Iowa in June. Carnegie-Stout Public Library is one of the most beautiful and unique libraries I've ever visited. We had some great groups of kids show up. Many thanks to Danielle Day for inviting me to be part of the fun! I had a blast hanging out with her! 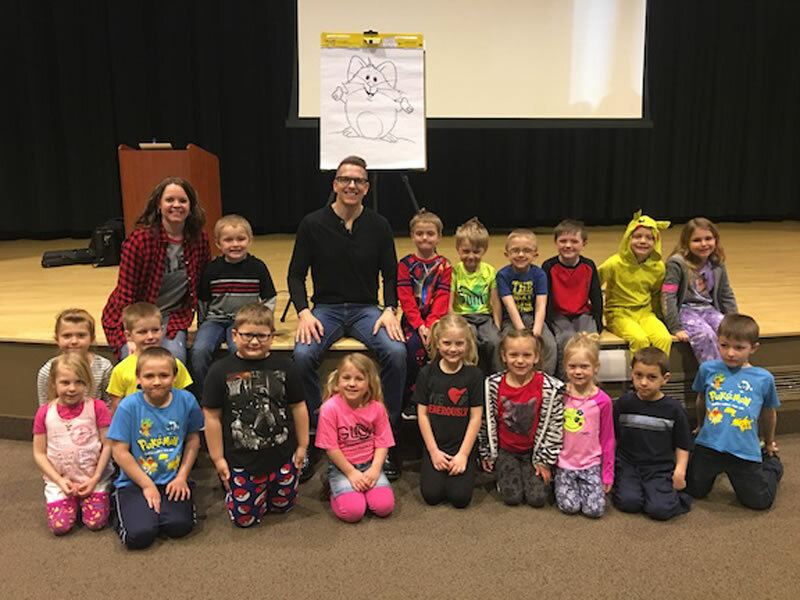 TEN PIGS: AN EPIC BATH ADVENTURE was just announced by Kansas State Librarian Eric Norris as the Kansas Reads to Preschoolers title selected for 2018. 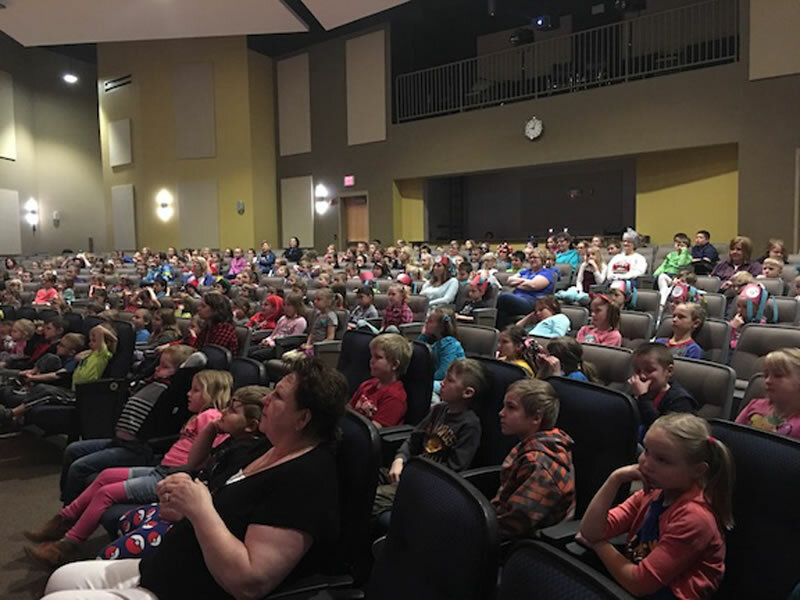 Kansas Reads to Preschoolers is a state-wide reading initiative that takes place each November. This terrific program promotes reading to Kansas children from birth through age five. I absolutely love programs like this! They're dedicated to getting young children excited about reading and books, which is critical at that stage of development. 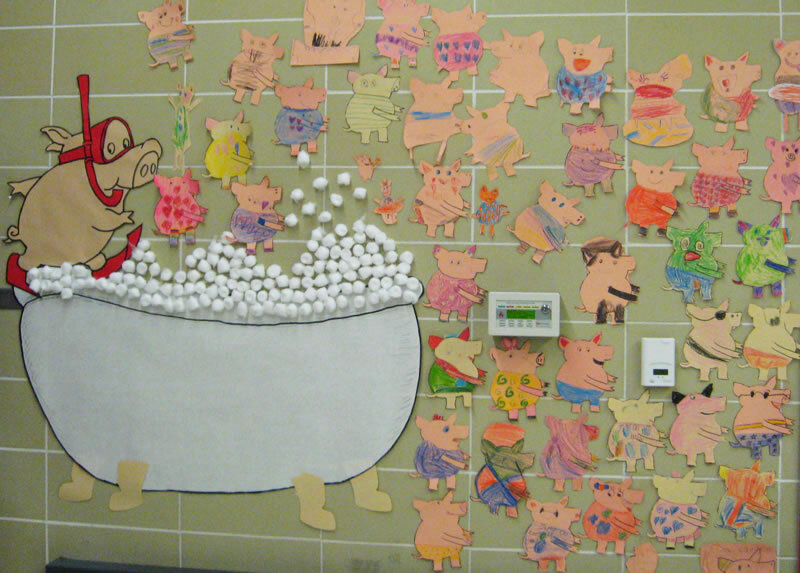 I know the pigs (and rubber ducky) are going to LOVE hanging out with all the young readers in Kansas. 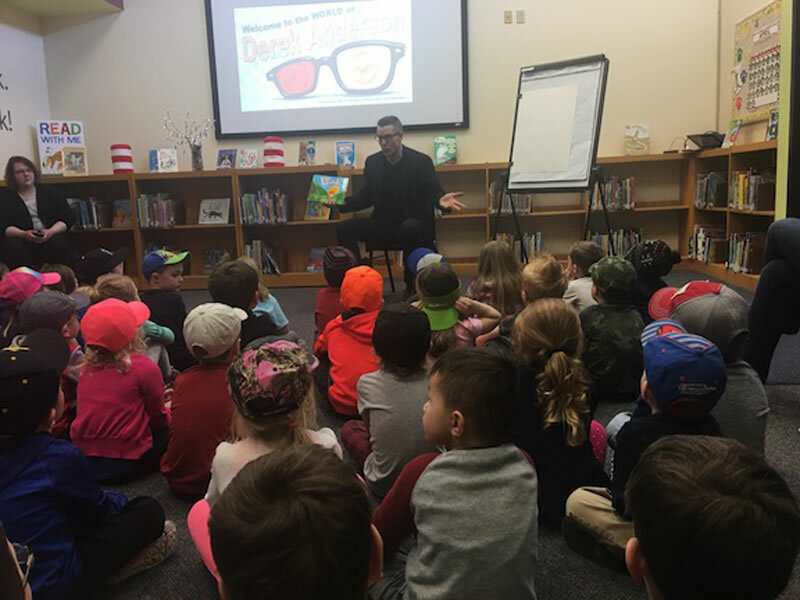 Special thanks to State Librarian Eric Norris and the Kansas Reads to Preschoolers committee: Sarah Tenfelde-Dubois, Patty Collins, Tracey DeShazo, Anne Harris, Donna Knoell, Vanessa Dauber, Janet Reynolds, Nikkie Sierra, Samantha Sulsar. And thanks, as always, to Ken Geist and David Saylor at Scholastic for splashing into that epic, over-crowded bathtub with me! 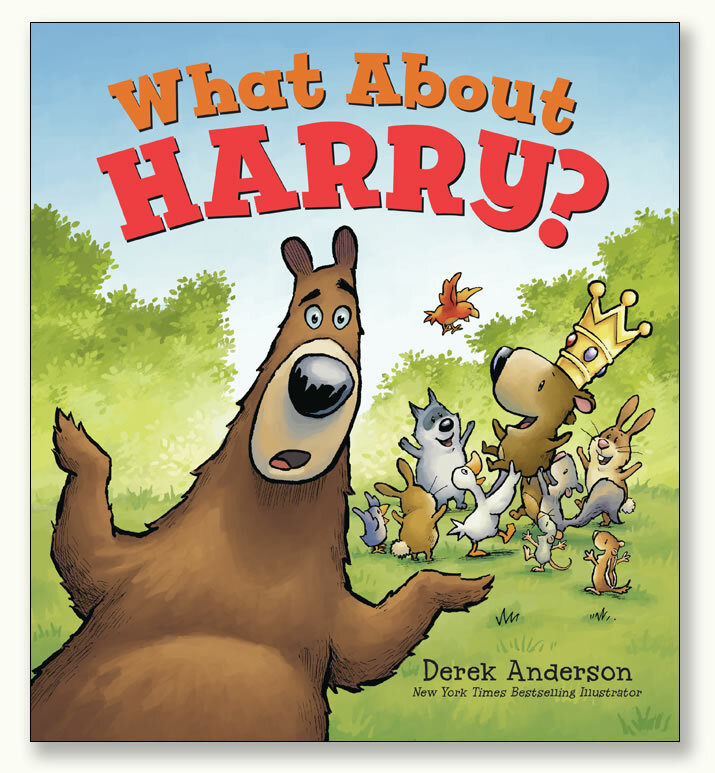 I was just given the green light by my publisher to reveal the cover of my February picture book WHAT ABOUT HARRY? SAM AND HARRY ARE BEST FRIENDS. jump higher, and swing better than Harry? if you don't have a friend to share the fun with? I will be sharing much more about this book in the coming months. WHAT ABOUT HARRY? arrives in the world on February 19, 2019. Summer Fun in Dubuque this Wednesday! 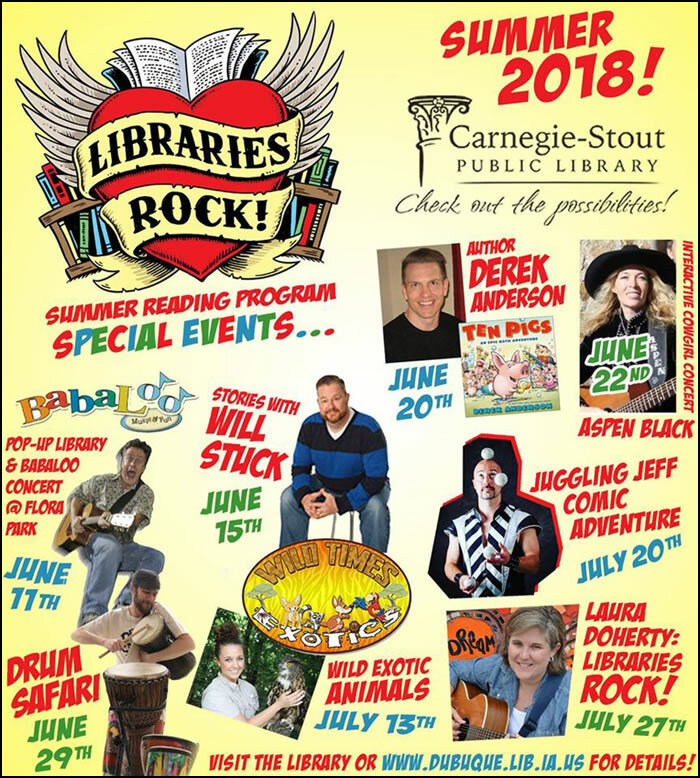 I will be speaking at the Carnegie-Stout Public Library this Wednesday, June 20th at 10am and 2pm. 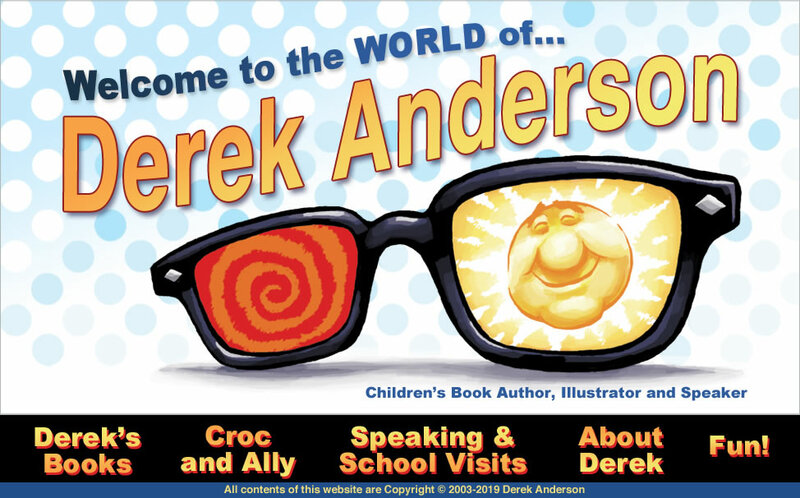 I will give a glimpse into the world of writing and illustrating children's books, show how I create characters and some of the secrets hidden in my books. There will be a drawing demonstration as well. This is a fun show for any kid (or grown-up) who is interested in reading, writing or drawing. Come by and say hello! This is going to be fun. See you Wednesday! 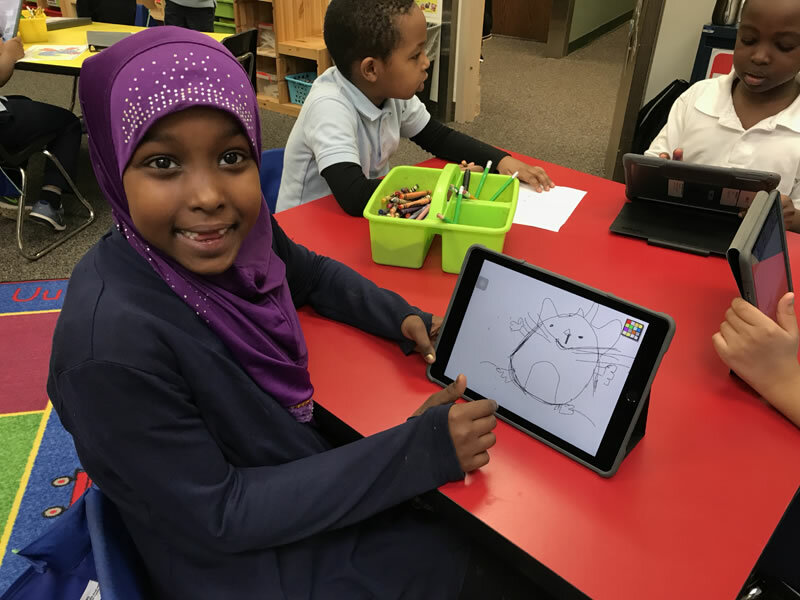 My last visit of the school year was at a super fun school called Global Academy in the Twin Cities. 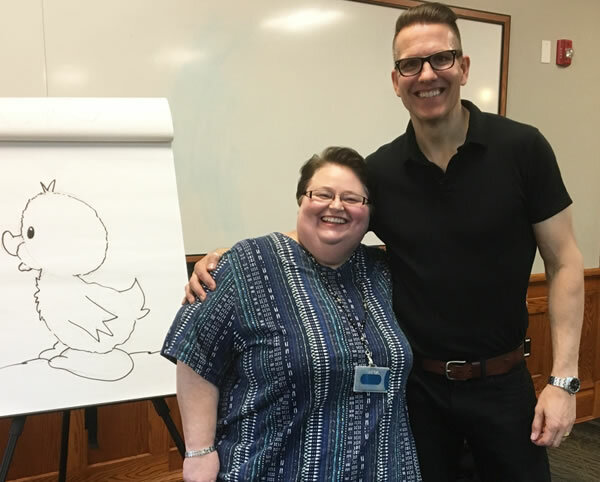 After I show my audiences how I create characters and stories for my books, I always end my presentations with a drawing demonstration. I love to hear that students have rushed back to their desks after my presentations to draw one of my characters. 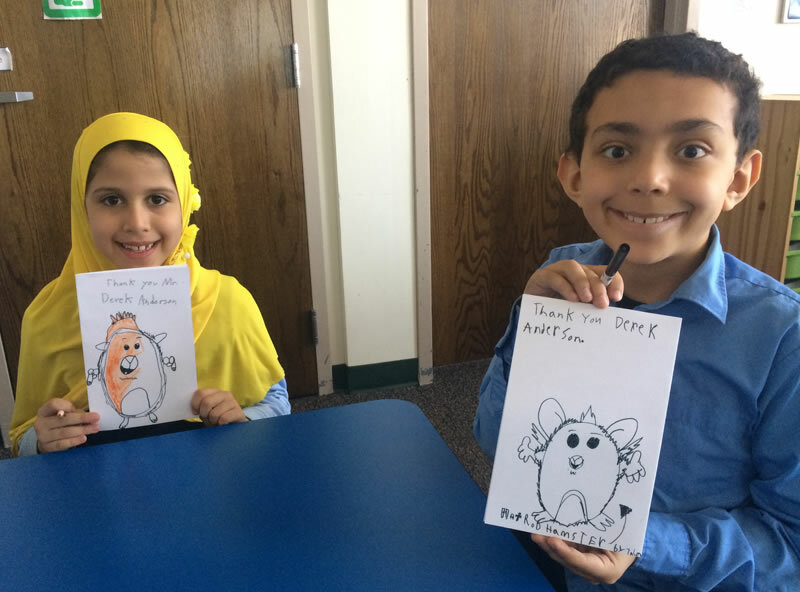 And thank you notes from students are the best! Many thanks to Melissa Storbakken and all the terrific teachers and students at Global Academy for a great day! 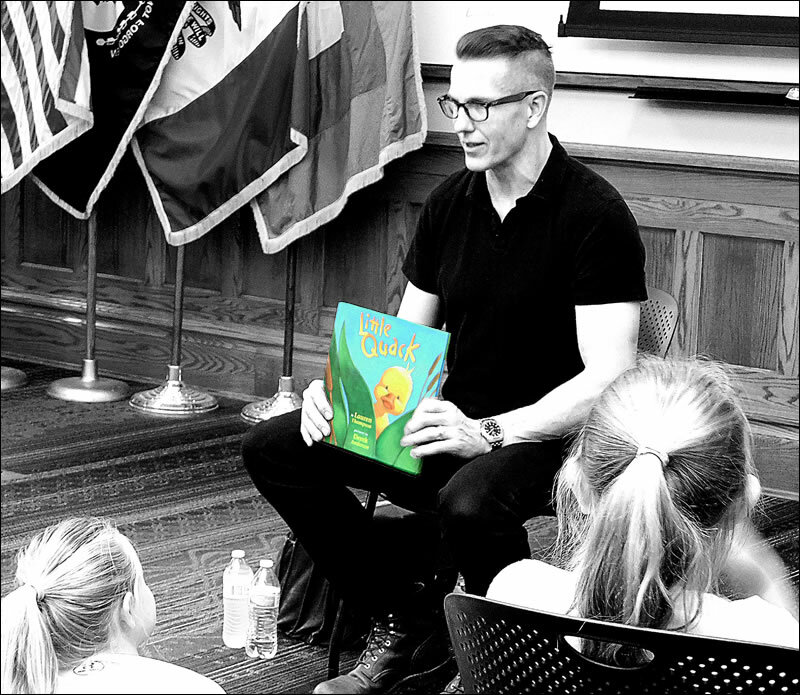 A few weeks ago I sat down for an interview with the terrific Jerri Heid from Ames Public Library for her 'Well Read' show. It was such a crazy weekend, Jerri and I didn't have time to do a pre-interview, so we rolled with it and had a nice chat in front of the cameras. Huge thanks to Jerri Heid and Derek Crisler for inviting me on the show. I always look forward to seeing these two. Jerri is a joy to be around. And Derek is not only an ace with all aspects of production, he's a great guy who knows how to make his guests feel at home in the studio. I doubt that Old Man Winter was sitting on his icy throne plotting his wintry storms to coincide with every event and school visit I had this spring, but it sure felt like it. 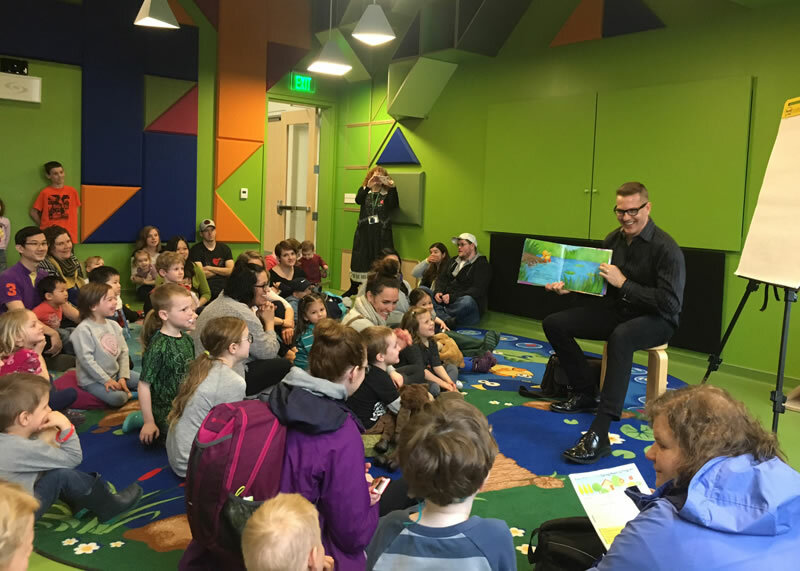 The weekend that I read at the Ames Public Library in mid April, we got eighteen inches of snow at home in Minneapolis. The roads were so bad, I couldn't return home until that Monday. I was supposed to leave for northeast Iowa on Wednesday and yet another blizzard was forecast, so I had to make the three and a half hour trip the night before. Other than a close encounter with a deer on a highway in Decorah, Iowa, I made it without incident. The winter storm came blowing in and forced a school delay the next morning. The terrific Media Specialist, Melissa Haberichter, and I joined forces and refused to let grumpy old winter get in our way. We had an amazing day! We didn't want to leave any students out of the fun. So I included a storytime with the preschool students. 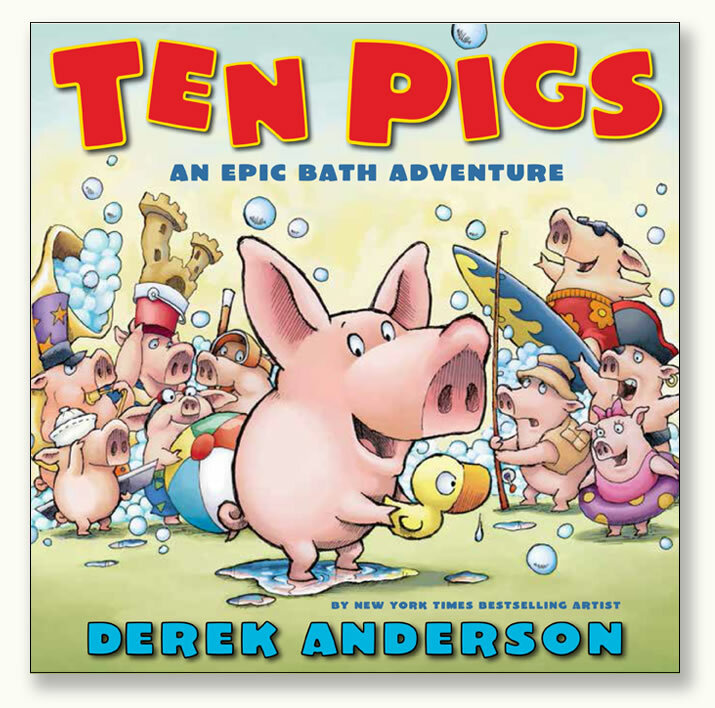 I read Little Quack and Ten Pigs: An Epic Bath Adventure. A reporter from Monona's local newspaper, The Outlook, showed up to chat. You can read his article HERE. That night I spoke at the Northeast Iowa Reading Council's meeting in Elkader where teachers, student writers and their families gathered for a dinner and presentation of their writing awards. It was such a fun, enthusiastic group. 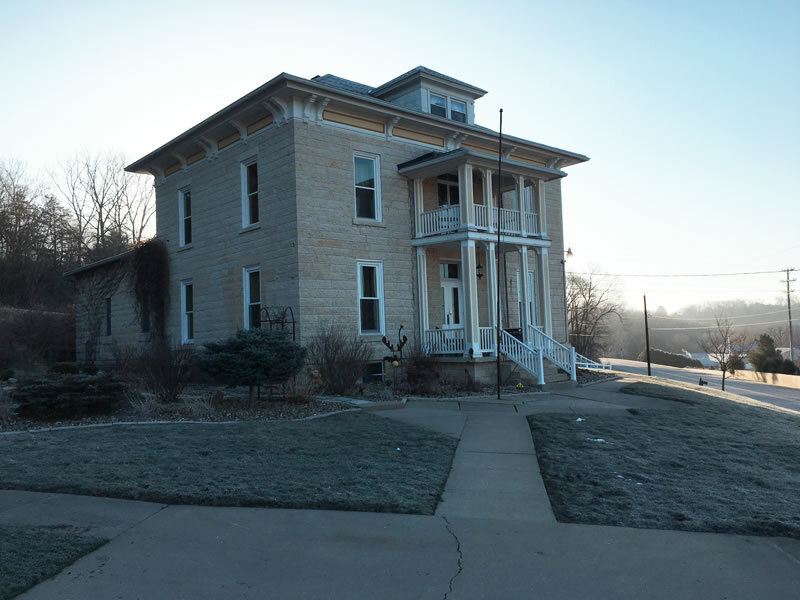 I stayed at the Jailhouse Inn in Elkader that night. Whoa, is this place interesting! It was a real county jail built in 1860. The jail cells are still intact. Fortunately, Julie doesn't put up her guests in the cells. I got to sleep upstairs where the jailer and his family lived back in the day. Because of the weather delay, I had one more presentation back in Monona in the morning. The students were so excited! I always do drawing demonstrations after my presentations. 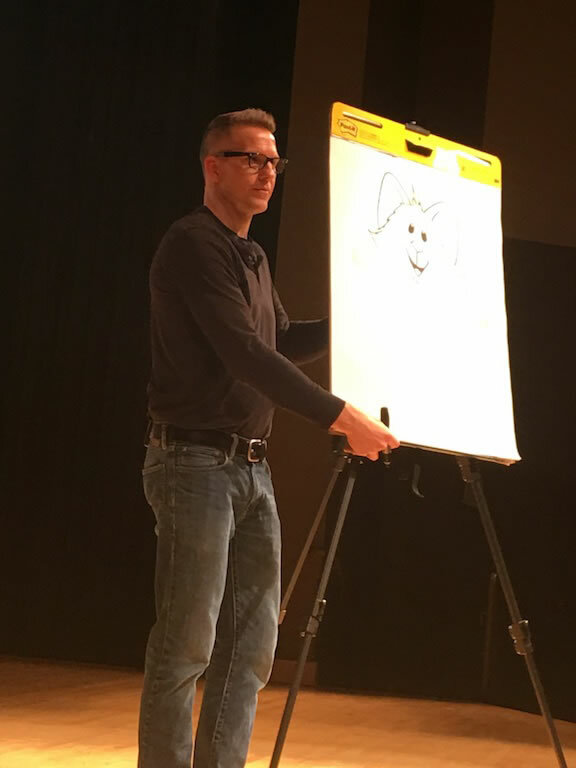 Here, I'm demonstrating how to draw Hot Rod Hamster on stage at MFL MarMac Elementary. I love speaking to big groups like this. The kids were really into it and they had so many questions during our question and answer session. I love my job! It was wacky day, so the students were wearing their wackiest outfits. Huge thanks to Melissa Haberichter for her planning and excellent hosting. With the weather and all of the obstacles we were up against, she never let anything get in the way of our visits. 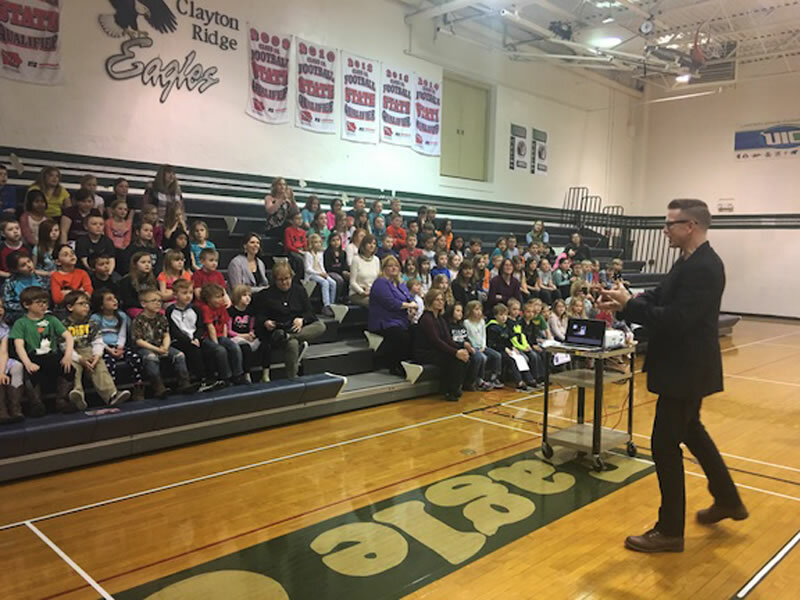 And thank you to the principals and teachers at MFL MarMac Elementary, Clayton Ridge Elementary and the many teachers at the Northeast Iowa Reading Council. 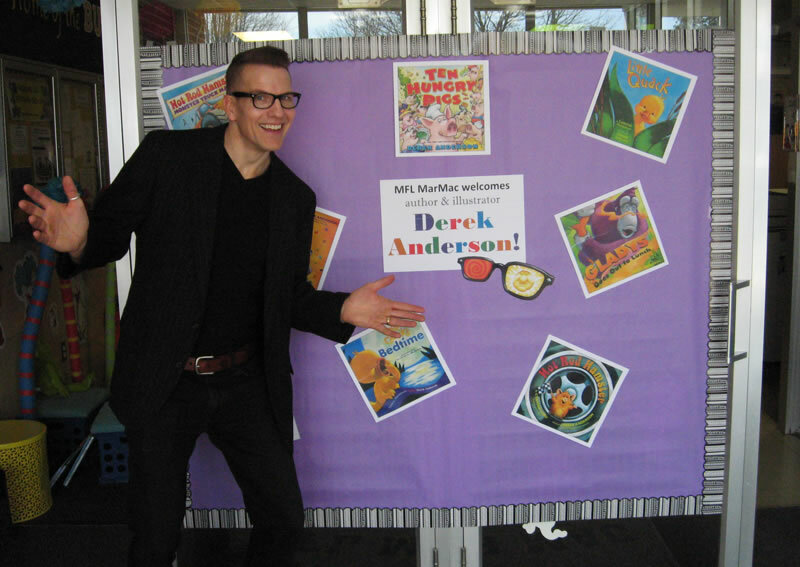 It was a great day reading to a full house at Ames Public Library on Saturday, April 14th. The weather was lousy- sleet, snow and cold, but the kids brought their parents anyway. We could only get a third of the audience in this picture. 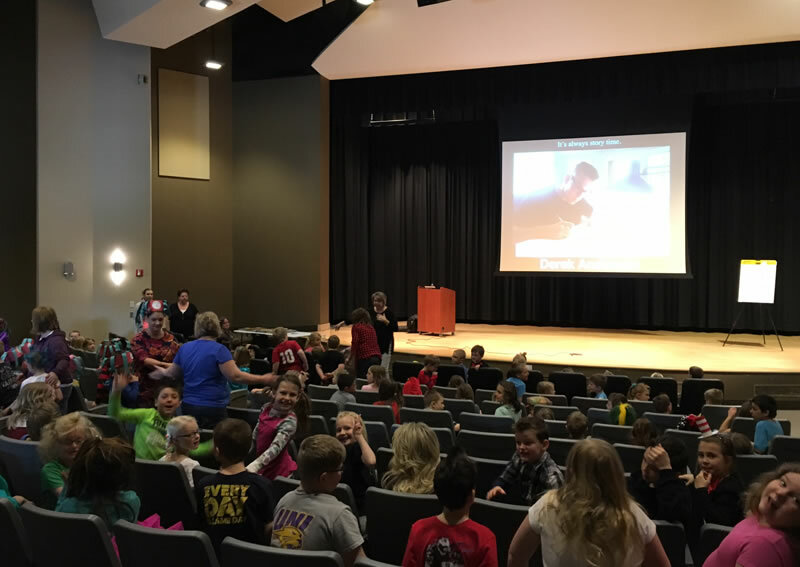 Thanks to Jerri Heid, Raising Readers in Story County and everybody at Ames Public Library! 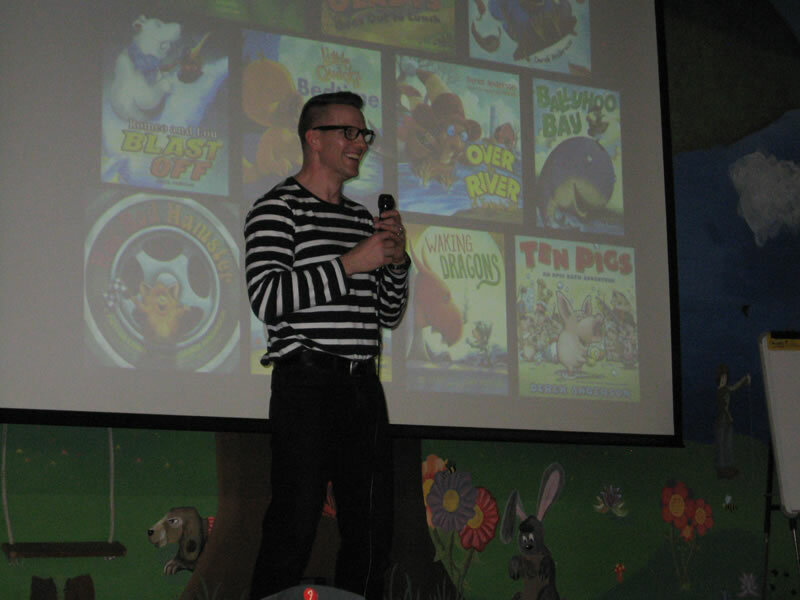 I had so much fun with the teachers, students and their parents at Lien Elementary in Amery, Wisconsin last week! When I arrived in the morning, I was greeted by the larger-than-life display (above) with Little Quack and Hot Rod Hamster. They even brought in a real tire for Hot Rod Hamster to stand on! Thanks to their art teacher, Renee Anderson, for all of her amazing work on this. What a fun way to start the day! 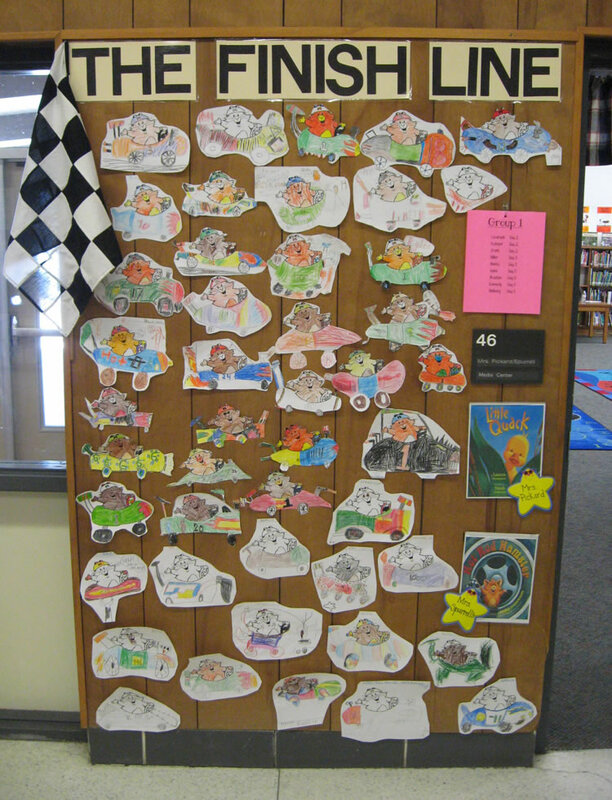 The students were excited to learn all about creating characters and stories for books. 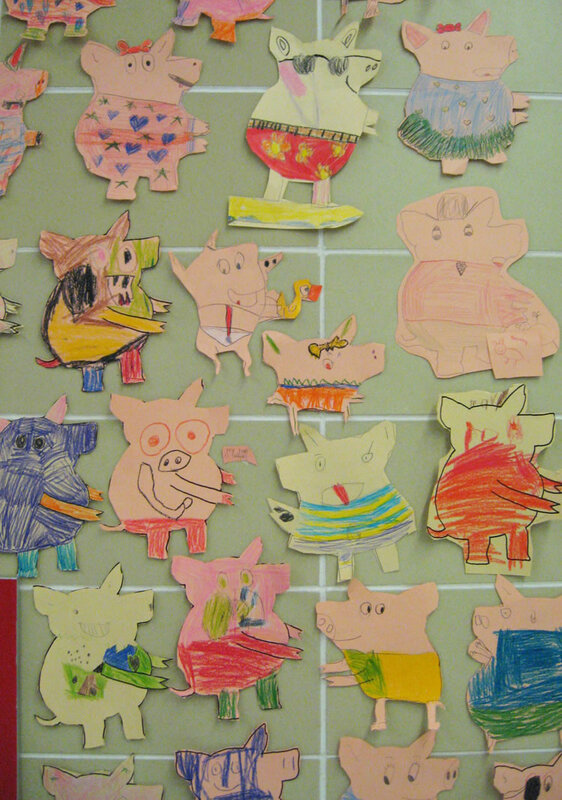 And the pigs they created to join in the epic bath fun! This kind of participation gives students a whole new insight into reading, stories and the work it takes to make them. It brings the characters out of the books and into their world. At the end of my talks, I always like to give students a glimpse into what's coming next. I introduced them to my two new friends, Croc and Ally! 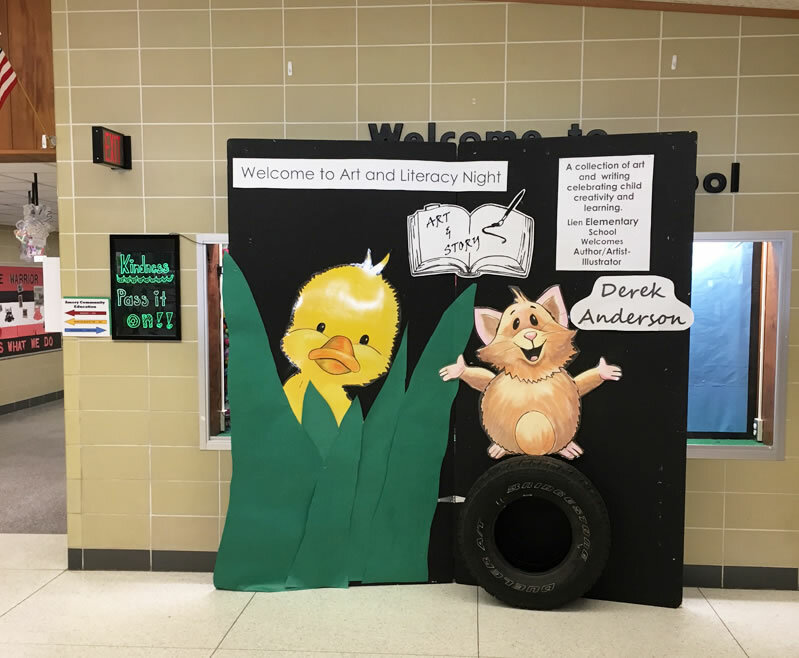 That evening, the students came back to school with their parents and I spoke to a packed house at their Art and Literacy Night. Thanks to Lori Pickard for her excellent planning and Sue Spurrell for all of her great hosting and photography skills. Thanks to JoNell Leadholm, my buddy who first brought me in to speak at Lien many years ago (this was my third time speaking there). And thanks, as always, to the Principal, Cheryl Meyer. She is such a terrific presence at Lien Elementary and has always been so warm and welcoming whenever I've visited. I'm coming home to Ames to celebrate Little Quack's 15th birthday and we would love to have you come and join us! 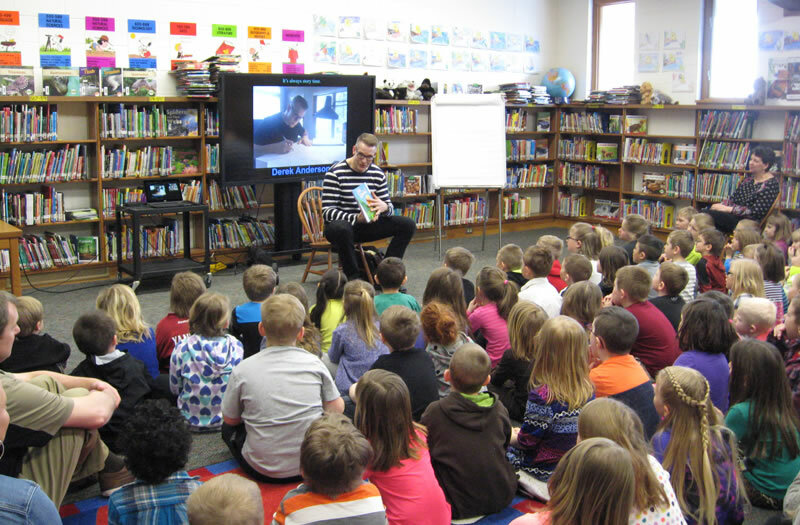 Little Quack and I will be at the Ames Public Library for Step Into Storybooks on April 14th! I will be telling fun stories, reading Little Quack and drawing. Books will be available for sale and signing after the event. Please come and join the Quacky Fun! Bring your kids or just yourselves. A Birthday Party for Little Quack! I will be telling fun stories, reading Little Quack, drawing and signing books. Please come and join the Quacky Fun! No gifts for Little Quack, please! Just bring yourselves and the kids in your life. 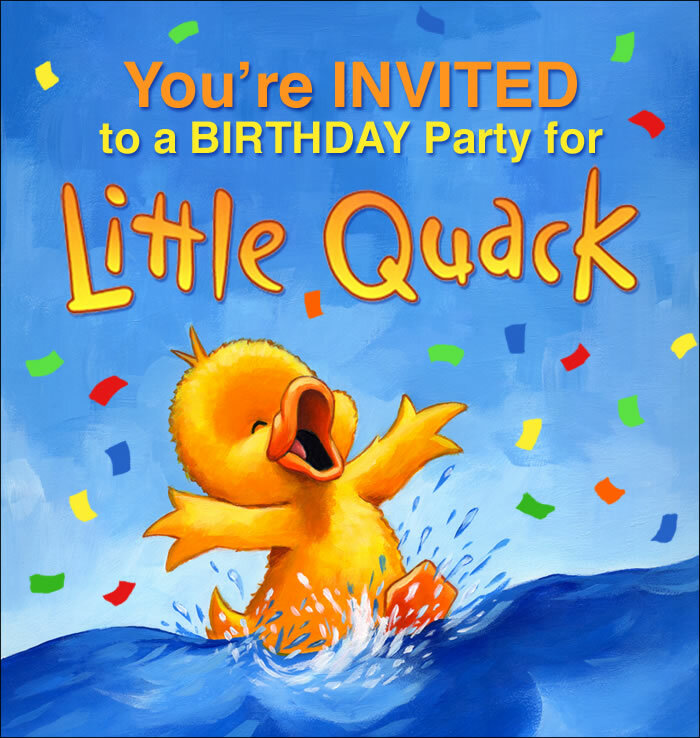 If you can't make it, but would like an autographed copy of Little Quack (or one of my other books) please call Red Balloon at the phone number above- they will have it signed on the day of the event and ship it to you! See you Saturday, March 17th! You can go to Red Balloon's website by clicking HERE. 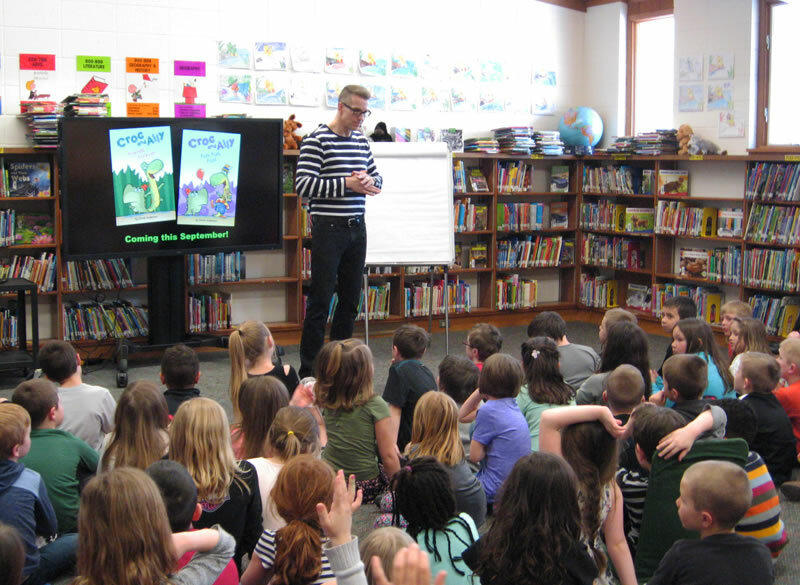 I had such a terrific time visiting Roxanne Book and the students at Otsego Elementary last week. 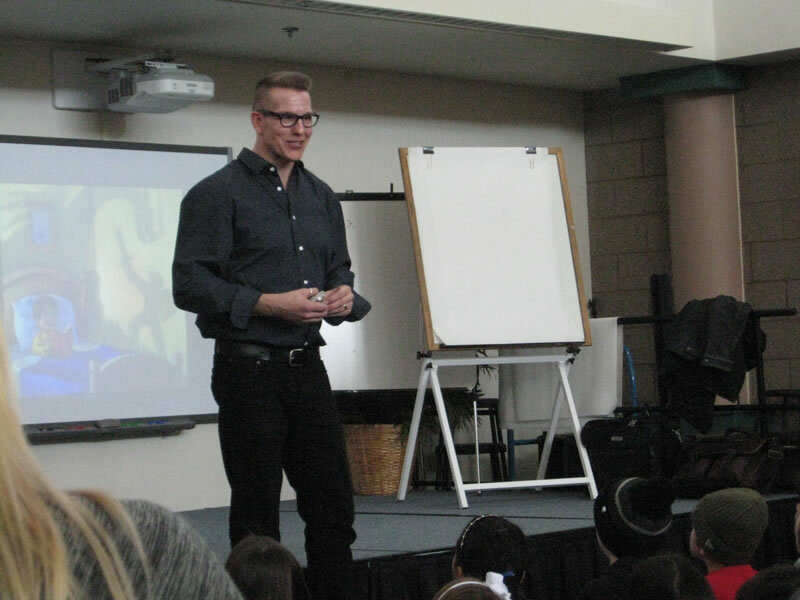 At nearly every school visit, something interesting happens. 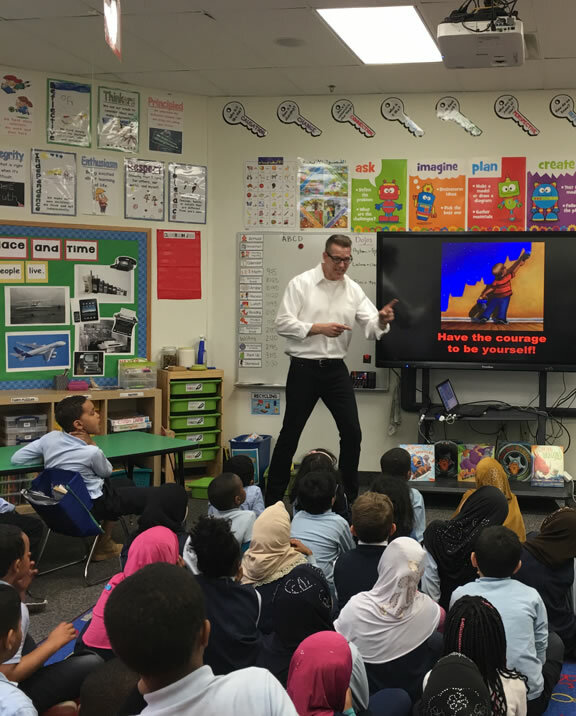 When you speak to as many kids as I do and to as many different age groups as I do, something unexpected is bound to occur. Sometimes it’s something a student says or does (a student tried to give me a tip once). And sometimes it's simply an unexpected question that comes up during the question and answer portion of my presentation. Last Friday, a first grader asked, “What’s your favorite genre?” I have to admit- he caught me off guard. I'm not used to hearing that kind of vocabulary from someone so young. This is hard to believe, but Little Quack was published fifteen years ago! 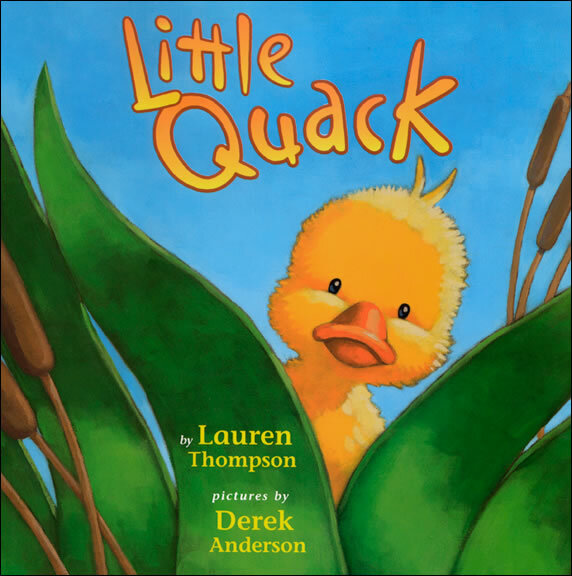 The tale of Mama Duck, Widdle, Waddle, Piddle, Puddle and Little Quack by Lauren Thompson changed my life. I don't know if I believe in fate. But I believe things happen for a reason. I'm sure of it. 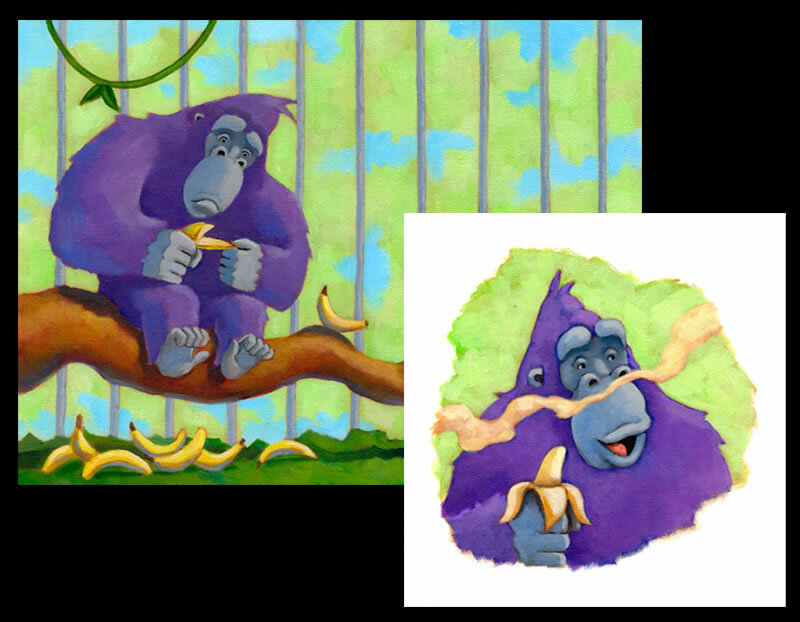 If it hadn't been for a painting of a purple gorilla, a gust of wind and a few words of sense from my wife more than fifteen years ago, I might not have ended up in publishing. During the winter between 2000 and 2001, I was nearing the end of my rope. I'd been sending work off to publishers for years and had received more rejection letters than you would ever believe. I'd received a few encouraging calls and letters from editors and art directors, but I wasn't getting any closer to a book deal. I'd quit my job a year and a half earlier and was free-lancing to make ends meet. My free-lance work grew quiet that winter, so I used the time to pursue publishing with everything I had. I wrote, drew and painted day and night. When that spring rolled around, I'd finished dozens of new paintings. I knew it was time to go to the publishers. This would be my last ditch effort. I was either going to get a book deal or change what I was doing. I contacted every editor and art director that I'd been sending my work to and told them I had a portfolio of new paintings and I was coming to New York. I asked each one if they would meet with me. They all said yes. I scheduled meetings for a week in May and began putting together my portfolio. It's crucial to get a portfolio right. You don't want to have too many pieces, or too few. You want strong work- in color and composition, character and narrative. And you only want to include your best pieces. Because they're mounted in a portfolio and you're traveling with it, you never take original paintings. Instead, you make high quality reproductions. I didn't have a good color printer at the time so I used a color copier at a local copy shop to size and print each of the twenty or so pieces. But there were two pieces I was on the fence about. They were pictures of a purple gorilla named Gladys. I even had a story about her, but she seemed so far out there, I didn't think publishers would be interested. I decided to include her and went ahead and made color copies of the pieces. Two weeks before my trip, I chose a breezy April day to put it all together. Each picture had to be cut out, sprayed on the back with a sticky adhesive and mounted on a portfolio page. One by one, I sprayed them outside on newspapers and then carried each inside to stick them down in my portfolio. Everything was going great until I got to Gladys. I took the first picture outside, laid it on the newspaper and gave it a good coat of spray. When I picked it up, a gust of wind took the picture out of my hand and it landed sticky-side-down on the grass. I couldn't believe it. It was only a copy, but it was ruined. And since I was unsure about whether or not to include it anyway, I took it as a sign. This was fate. It couldn't have been clearer to me. Gladys was not supposed to be in my portfolio. I finished assembling the rest of the portfolio and left both pictures of Gladys out. When Cheryl got home from work that night, I told her it was ready. "Let me see," she said. She paged through, carefully studying each piece and the order I'd chosen. When she got to the end, she said, "Where's Gladys?" I told her what had happened and that I'd decided to leave the pictures out. "You can't leave Gladys out," she said. "You have to make another copy and put her back in." Here was my wife going against fate. Fate wasn't nearly as vocal as Cheryl was. So I drove back to the copy shop that night, made another copy and put the pictures of Gladys back in. I still wasn't sure about my decision until I walked into Simon & Schuster on my first day of meetings in New York. I'd had some contact with Kevin Lewis and his assistant, Alyssa. I'd been sending them work for more than a year. We chatted a bit before we sat down. And then Kevin began flipping through my portfolio. He asked about a few of the pieces and what I was after, story-wise, with some of the narrative details. And then he got to the page with the Gladys pictures. He stopped and looked up at me with these absolutely piercing eyes and I braced myself for what he was about to say. "Have you been holding out on us?" he asked. "What?" I said, a little shocked. "No, why?" "Why haven't we seen this before?" "I just finished it," I said. "THIS," he said, "This is what we want!" I almost didn't believe him. I can remember that conversation word for word. The moments where your life changes tend to stick with you. That meeting lasted an hour and a half. Kevin and Alyssa talked about a manuscript they had called Little Quack by Lauren Thompson. They said they'd been considering another illustrator, but I was perfect for it. They didn't offer it to me right away. It took months to get everybody at Simon & Schuster on-board with the idea of bringing in an unpublished and unproven artist to illustrate a picture book. But they offered it to me later that summer and I was working on sketches for Little Quack that fall. Little Quack was published fifteen years ago this month. Was it fate that I would illustrate it? I'm not sure if I believe in it. And I don't believe in luck, either. I think we make our own luck. But if I did believe in luck, I would say I'm lucky I didn't give up when the rejection letters poured in all those years ago. I'm lucky I was so stubborn and pressed on even though the odds were against me. I'm lucky that I didn't listen to the people that told me this dream would never come true. I'm lucky my free-lance work grew quiet that winter and that I took the time to paint all those pictures, both good and bad. It really helped me develop my work. I'm lucky the wind took a picture of a purple gorilla out of my hand. And I'm really lucky that Cheryl had the good sense to talk me out of believing it was fate. If I hadn't walked into Simon & Schuster and met with Kevin and Alyssa on the day I did and with that portfolio, someone else would have ended up illustrating a terrific manuscript by Lauren Thompson called Little Quack. Fate? Luck? You can call it what you want. I get to spend my life creating books and it's exactly where I'm supposed to be. and a whole NEW website! I’m so excited to introduce you to my new friends Croc and Ally. Croc is a little grumpy, and you'd think that would bother Ally. It doesn't. Not one bit. To say Ally is happy-go-lucky would be an understatement. He is one goofy alligator and the two of them couldn't be better friends. 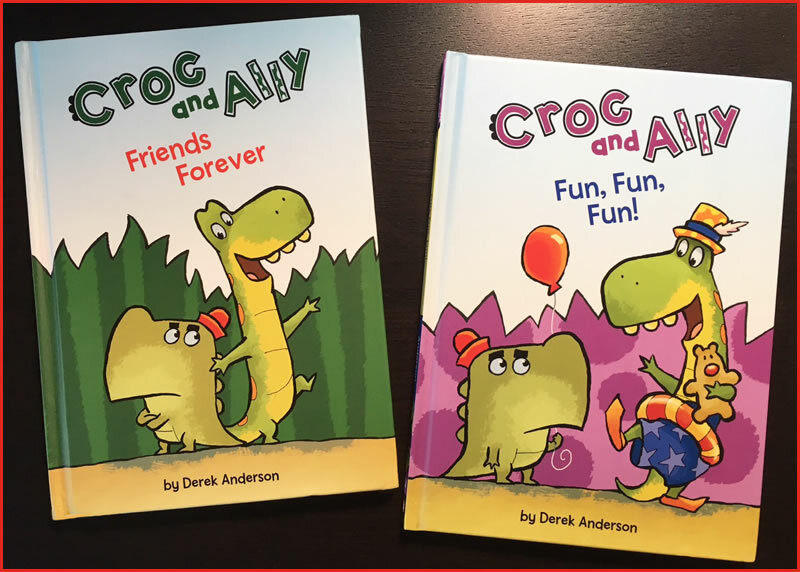 Croc and Ally have TWO new books coming out in September. I can’t wait to show you more of their world! In the meantime... we did a bit of tidying up around here. Come on in to the newly remodeled website and have a look around. I will be posting a whole lot more in the coming weeks and months.